From the moment you step onto the campgrounds, you’ll be surrounded by new things. You will quickly learn the layout of the camp and find the quickest way to get from your cabin to your favorite activity. You’ll spend the summer trying new foods, stepping out of your comfort zone and trying new activities, and learning new skills that you’ll carry with you throughout the school year. 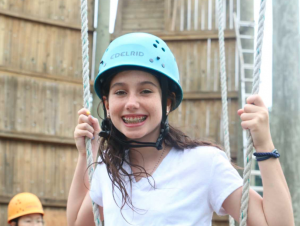 Camp has this unique way of making you feel safe and confident to try new things, and you’ll continuously learn new things about yourself in the process. You’ll learn new problem-solving strategies, time management skills and conflict resolution. You’ll leave camp confident that you can do new things! At America’s Finest Summer Camps, you will have the opportunity to meet friends that you may have never met otherwise. Campers from all over the country, and across the globe, come to America’s Finest Summer Camps for a camp experience of a lifetime. You will, without a doubt, make new friends, laugh until you cry, and go home with plenty of new phone numbers so you can keep in touch with your friends even when you aren’t at camp. Some of the campers that you bunk with could become lifelong friends. You will be surrounded by people of all different races and backgrounds, and if you’re not the type to walk up and introduce yourself to strangers, your camp counselors will make sure you get connected with the right people. If this is your first time away from home, you may be nervous about your newfound independence. But you’re never alone, and your counselor will help you feel confident about making your own decisions and choices, and you’ll quickly begin to enjoy the feeling that comes with being responsible and independent. From making your bed on a daily basis to following a schedule, camp will help you learn skills that will foster independence and responsibility long after you leave camp. This is something your parents will notice right away when you come home from a summer at camp; you will grow and mature in many ways without even realizing it. Many campers say that the relationships they make with counselors is one of the most unique parts of their sleepaway camp experience. Before you ever get to camp, you can be sure that there are counselors who know you are coming, know your name, and know this is your first summer. Your counselors are already excited to see you and are ready to show you all the things they love about camp. Your camp counselor might be from the same state as you, or they might be from a country you’ve never visited. Camp gives you the chance to connect with counselors from all over! It’s Going to Be the Summer of Your Life! If you get butterflies thinking about your first camp experience, you’re perfectly normal! It’s completely natural to get nervous about trying something new. But, instead of worrying about the unknown, try to focus on the facts: America’s Finest Summer Camps have been giving kids the ultimate camp experience for decades, and if it wasn’t the coolest place on the planet, why do so many campers come back year after year? And why do they come back as counselors? It’s because America’s Finest Summer Camps have perfected the sleepaway camp experience and know how to make a first-timer feel confident, secure, happy, safe and at home. You only get to experience camp for the first time once, so try to soak in every little minute. You are about to embark on an adventure you’ll never forget!